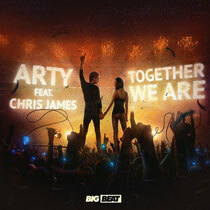 Early last year, Russian DJ/producer, Arty, gave the first taste of his single, ‘Together We Are’. First heard on Avicii’s radio show in January 2012, the track had its biggest transition in December 2012 with the involvement of Chris James, of Grammy nominated fame with Deadmau5’s ‘The Veldt (Tommy Trash Remix)’. Revealing its emotional power, Arty and Chris recently released the unplugged trailer of ‘Together We Are’, which is set for release on February 18. Arty has already released tracks like ‘Get On’, ‘Kate’, ‘Around The World’, ‘Trio’, ‘Mozart’, ‘When I See You’ and countless more. With ‘Together We Are’, possibly one of his finest pieces of production to date, the success story looks set to continue. It’s released on Big Beat Records, check the video out below.